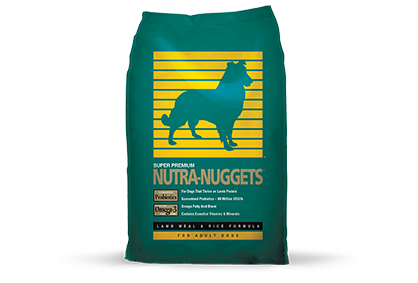 Nutra-Nuggets Lamb Meal & Rice Formula is the optimum formula for dogs who prefer the taste of lamb. Supplemented with glucosamine and chondroitin and formulated with the proper balance of omega fatty acids to promote overall health and a beautiful, shiny coat. Lamb meal, peas, ground white rice, rice bran, wheat flour, dried yeast, egg product, chicken fat (preserved with mixed tocopherols), fava beans, dried beet pulp, flaxseed, natural flavor, fish meal, salt, potassium chloride, DL-methionine, choline chloride, taurine, glucosamine hydrochloride, dried Lactobacillus plantarum fermentation product, dried Bacillus subtilis fermentation product, dried Lactobacillus acidophilus fermentation product, dried Enterococcus faecium fermentation product, dried Bifidobacterium animalis fermentation product, vitamin E supplement, iron proteinate, zinc proteinate, copper proteinate, ferrous sulfate, zinc sulfate, copper sulfate, potassium iodide, thiamine mononitrate, manganese proteinate, manganous oxide, chondroitin sulfate, ascorbic acid, vitamin A supplement, biotin, niacin, calcium pantothenate, manganese sulfate, sodium selenite, pyridoxine hydrochloride (vitamin B6), vitamin B12 supplement, riboflavin, vitamin D supplement, folic acid.